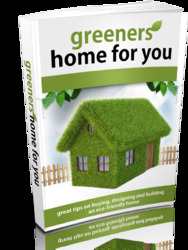 For the purpose of this chapter it is assumed that the pile design will be carried out by a specialist piling contractor. The actions on the piles must be clearly conveyed to the pile designer, and these should be broken down into the unfactored permanent actions and each of the applicable variable actions (e.g. imposed and wind actions). The pile designer can then carry out the structural and geotechnical design of the piles. Where moments are applied to the pilecap the EQU combination should also be used to check the piles can resist the overturning forces. These EQU loads must also be clearly conveyed to the pile designer and procedures put in place to ensure the piles are designed for the correct forces. Alternatively, a truss analogy may be used; this is covered in Sections 5.6.4 and 6.5 of Eurocode 2-1-1. The strut angle Y should be at least 21.8° to the horizontal; note that Y should be measured in the plane of the column and pile. 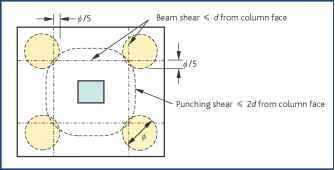 Both beam shear and punching shear should then be checked as shown in Figure 6. For beam shear, the design resistances in Table 6 may be used. 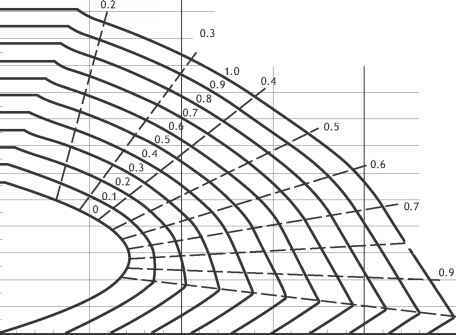 If the basic shear stress is exceeded, the designer should increase the depth of the base. Alternatively, the amount of main reinforcement could be increased or, less desirably, shear links could be provided. Care should be taken that main bars are fully anchored. As a minimum, a full anchorage should be provided from the inner face of piles. Large radius bends may be required. When assessing the shear capacity in a pile cap, only the tension steel placed within the stress zone should be considered as contributing to the shear capacity (see Figure 7).